Day 5 of our 12 Crafts of Christmas fun brings you this adorable and simple craft the kids will love. 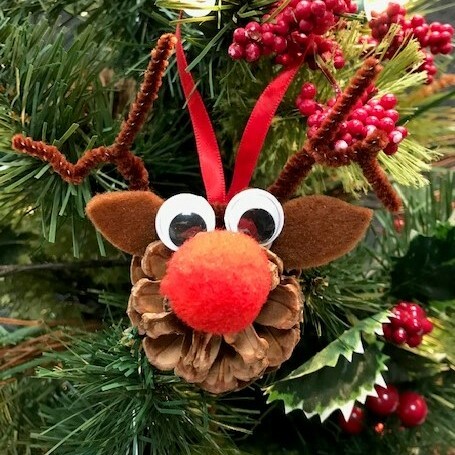 Our reindeer pine cone decoration is so cute and easy to make that it would be rude-olph of us not to share it with you. Using a few craft cupboard basics and one from Mother Nature, this decoration is so easy and inexpensive to make that we have no i-deer why anyone wouldn’t want to make it! To start, take one of your pipe cleaner stems and wrap it around the pine cone. Now twist the ends over each other at the top (to fix the antlers in place). You should be left with about 5cm of surplus pipe cleaner to work with at either end. This will form the main part of your reindeer’s antlers. Take a second pipe cleaner stem and cut it down to about 6cm in length. Now wind this cut piece around one of the antler pipe cleaner stems attached to the pine cone. Shape this so it looks more antler-shaped. Repeat this process with the second antler so you have a pair of antlers worthy of one of Santa’s sleigh team. Next, take a piece of brown felt and cut out two small ear shapes. Apply a blob of PVA glue to the felt and attach these to the pine cone (in front of the antlers). 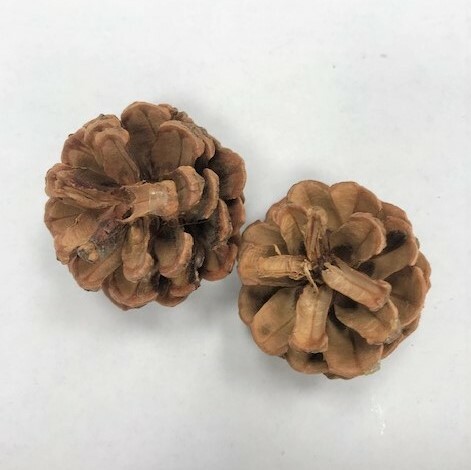 Now take two wiggly eyes and stick these to your pine cone. 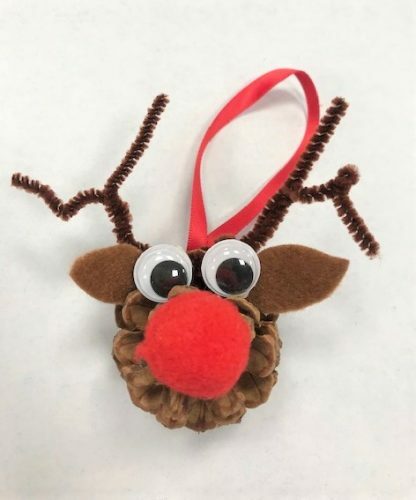 Glue your red pom pom to the pine cone for the reindeer’s nose. Now all that is left to do is to apply a length of ribbon or a loop of twine to your decoration so that you can hang it. Don’t forget to check out tomorrow’s Bright craft idea!